Our stories should be “protein” that grows and changes along with the reader, according to Ms. Yolen. I was fortunate enough to be able to listen to the multi-award winning children’s writer who has penned over 200 books at the local children’s book festival. Like most kids, I grew up on the PB&J diet. Nearly every day of my school career I gobbled my white bread sandwich with Oxhart peanut butter and grape jelly. Thankfully, naturally peanut butter has improved…in those days the end of the jar resulted in a few dry as sawdust sandwiches. In my thirties, I still love peanut butter, but my tastes have “refined” some over the years. Now my tastes run towards Molten Chocolate Cake with Peanut Butter filling or Chicken Pad Thai from my favorite Thai restaurant. Now granted my choice of Molten Chocolate Cake with Peanut Butter filling probably isn’t the best choice for adding protein to my diet, but when Jane Yolen shared that our stories should “grow up” with us, I pondered favorite stories of my childhood. One of my favorite children’s books is Charlotte’s Web. As a child I read this book and marveled at the bravery of Charlotte. As I got older I pondered what it really means to be a selfless friend like Charlotte. As a mother myself, I lament the death of Fern’s innocence even as I know such a loss will happen in my own daughter’s life. At every age and stage, I have delighted in the characters. We groan over the selfishness of Templeton, have a tissue-box moment when Wilbur is told by the sheep of his future fate, and delight in laughing at the antics of all of the animals. Charlotte’s Web is truly a nourishing read, one from which I gain something new at every stage of life in which I read it. I also read a certain series of books about teenage babysitters as a preteen. These books were what I would call “twaddle” or idle chatter. We’ve all read and enjoyed these books at times, but is there any sustaining value? And would I gain any new insights into those babysitters if I picked those books up again? I doubt it. I can only speak for my own experience, but in truly memorable books, it is often the characters that stand out to me. How can we create memorable characters that will grow with the reader? 1) 1) Give your main character a memorable name. Characters that we remember tend to have an unusual name or a name with a particular meaning behind it, especially if the meaning is in some way symbolic to the story. I love using http://www.babynamefinder.com/ to discover new character names. 2) 2) Give your characters unusual characteristics that will be associated with them alone. We immediately associate Miss Havisham from Great Expectations with her unshakeable obsession to continue to wear her wedding dress many years after her sweetheart has left her life. Who else but Dr. Watson carries a stethoscope under his top hat? 3) Give your characters an unique voice. Anne Shirley is known for her excessive prattling and "eloquent" language. Nick Carraway from The Great Gatsby is a narrator we're never sure we fully trust. He complains incessantly about the other characters in the novel, yet spends all his time hanging around with them. 4) Great characters are "protein" themselves, growing and changing throughout the story. In the CBA market we are looking for the character to demonstrate growth spiritually and emotionally. A good example of this would be Charity in A Passion Redeemed who undergoes a complete transformation in the hands of Julie Lessman. Another great example is Morrow from Courting Morrow Little as she progresses and grows to understand the true meaning of forgiveness. What sets your character apart from all the others out there? Or, do you have a favorite character in literature that has changed and grown with you? My favorite all-natural peanut butter was Smuckers . . . Good points about how a well-written character, even from a children's story, grows with you into adulthood. The first character that popped into my head as I read this was Reepicheep from the Narnia stories. He made me laugh as a child. But when I listened to the story again this week with my autistic student, he brought tears to my eyes. His total focus on reaching Aslan's country (Heaven) no matter what the cost means more to me now than it ever could have then. I love his bravery and his panache and his style with words, as in this quote: "While I can, I sail east in the Dawn Treader. When she fails me, I paddle east in my coracle. When she sinks, I shall swim east with my four paws. And when I can swim no longer, if I have not reached Aslan's country . . . I shall sink with my nose to the sunrise." Love to read your posts, Julia, and congrats on being chosen as a reviewer for the Historical Novel Society! You have just the right kind but discerning voice for such a task! I have to say Jane Eyre is one that I have grown up with (since summer reading my Sophomore year of high school)...She seems so bland and submissive at first, but then you watch her transform into a woman of courage and strength when she encounters her heart. Although, I've read it three times, I need to pick it up again with your post in mind now. Wonder if I'll find any parallels in my own shifts in protein preference! :) Great post Julia! Great article!! I love the idea that stories "grow up with us," and especially love it when characters do, too, which is why Charity is so fun to write. More than any of the other O'Connor characters, she seems to grow with every single book. Mmm ... I guess that's because she had so much growing to do!! Uh, anybody else hungry for peanut butter??? Julia, what great info you offer. As a character-driven author, I love to see uniqueness in characters. Unusual names, dialogue, or characteristics make them stand out and stick with me. Normally, I can recall a character's personality but tend to forget his or her name. When an author adds meaning to the name enabling me to remember it, I like that. I LOVE names for heroes:) Reading old census records always help me - sometimes you find a doozy! Thanks for such an interesting post. Great post, Julia! One of my first meatier reads as a teenager was the Christy Miller series by Robin Jones Gunn. I felt like I grew up along with Christy in each book, and I still love to revisit those books from time to time. Renee Ann, I agree Smuckers is much better. I think they only had the one option when I was younger in the stores :. 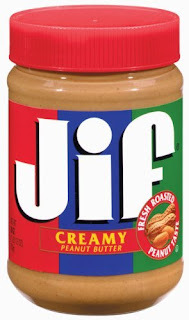 For some reason I thought of the "choosy moms choose jif" slogan, hence that's the brand I used for the photo. Seemed to match :). I so agree with you about Jane and now wish I had included her, too. She undergoes so much transformation (and so does Rochester for that matter). Can't wait to see what they'll do in the upcoming film production. Have to confess I'm character-driven as well. I find that's what I remember most about books. I've never read Karen's work, but I understand she is a must-read for historical fans...so I'm sure I will eventually. And as for Preacher's Bride, you know I noticed the names when I read...but then didn't think of them when I wrote this post. You're right, they are both excellently drawn characters and aptly named. Definitely a favorite book of mine for 2010. That sounds strangely interesting looking at the census records. Chris and I enjoy walking cemeteries and looking over names. I'm guessing we have hundreds of pictures Chris has taken of a beautiful local cemetery. Forgot about Valancy. Yes, she is one I will never forget, along with Emily Byrd Starr. I really need to reread some Montgomery again. I've never read Christy Miller, but I've heard these are some of the best Christian YA books out there. That's neat that you felt like you grew up with the characters, speaks very highly of the series. Ooh, good post! I really don't like peanut butter, but I get the point :) I love your list to creating a memorable character. Good, strong, relatable characters with a little bit of a quirk are the best tools we have to creating a book that will truly stay with readers. Hank the Cowdog, is probably the one I was referring to, and yes that is a great point, because if you never get anything out of your reading, why keep going?? I am reading Gina Holme's Crossing Oceans right now and WOW what a story! I don't want to stop reading. I'm reading a character right now I know I won't forget. A funny fifth grader named Felix from Wally Lamb's Wishin' and Hopin'. The book is a little crass, but it is funny as all get out. I'm laughing so much. Felix stands out b/c he's so honest. I think good characters act in honest ways--things we might think but might be afraid to write. True writers write the real. I think kids often make the most memorable characters. And oh, I love your statement about "true writers write the real." I think that is why Mary DeMuth is one of my favorite authors. A woman after my own heart!! Peanut Butter and LONG blog posts. Sigh. I knew I liked you!! Author DiAnn Mills really urges authors to take naming their characters very seriously. Personally, I never put a great deal of thought into it until about two years ago - and then it became a fun kind of game. What name fits? Not only my character, but the entire 'character' of my story. I chose the name 'Ashleigh' for my historical because of the information I learned about the Ash-tree. Eisley is my contemp romance heroine - and her name is unusual, and passed down throught he generations in her family. Dr. Adelina Roseland wants to present herself as very important, when at her heart, she needs to find home. Her name is BIG, until she meets Reese Mitchell - who calls her Dee. I've not put that much thought into all my characters names, but I do much more now. OK, Pepper, you really have me intrigued now. I'm off to look up Ash-tree. I really liked the name, now I'm intrigued to know why you picked that spelling. I like the thoughts behind your names. Wow, that's interesting. I did learn that some believe ash can cure warts and rickets. I'm guessing that is not how you chose it :). I didn't realize there were many legends and myths surrounding the Ash Tree. Ash trees are 'healing' trees - and my heroine is a nurse. Also, as one of my research findings states "Ash trees are strong and highly resistant to shock" - which you'll find my character is both. It was really cool to play around with that dynamic. It's also an 'ever greeen' type of tree- which worked out well, because my heroine needs to endure.